In 1-gallon resealable food-storage plastic bag, mix shrimp and marinade ingredients. Seal bag. Refrigerate 30 minutes. Meanwhile, in medium bowl, mix cucumber salsa fresca ingredients. In small bowl, mix yogurt crema ingredients. Drain shrimp; discard marinade. Heat 12-inch nonstick skillet over medium-high heat. Add shrimp; cook 3 to 4 minutes, stirring occasionally, until pink. Drain, if needed. 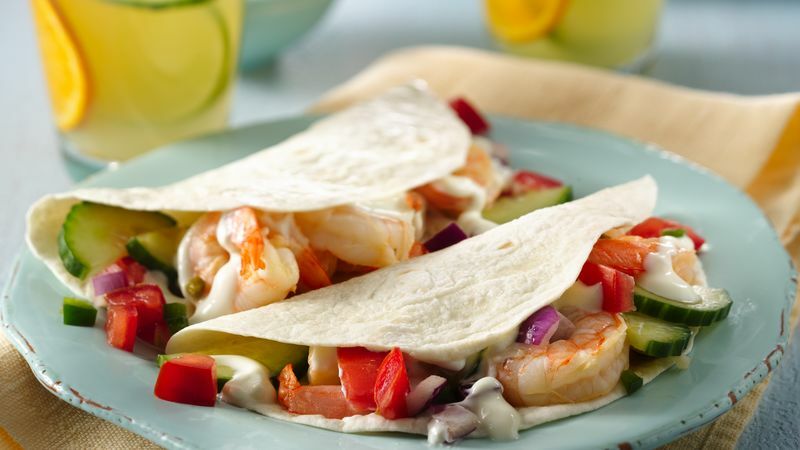 Spoon shrimp on tortillas; top with cucumber salsa fresca, and drizzle with yogurt crema.